The counties in North Florida generally lie along Interstate 10, from Jacksonville at the Eastern end over to Pensacola at the Western end, and along Interstate 75, from where it intersects with Interstate 10 down to Ocala, at the Southern end. 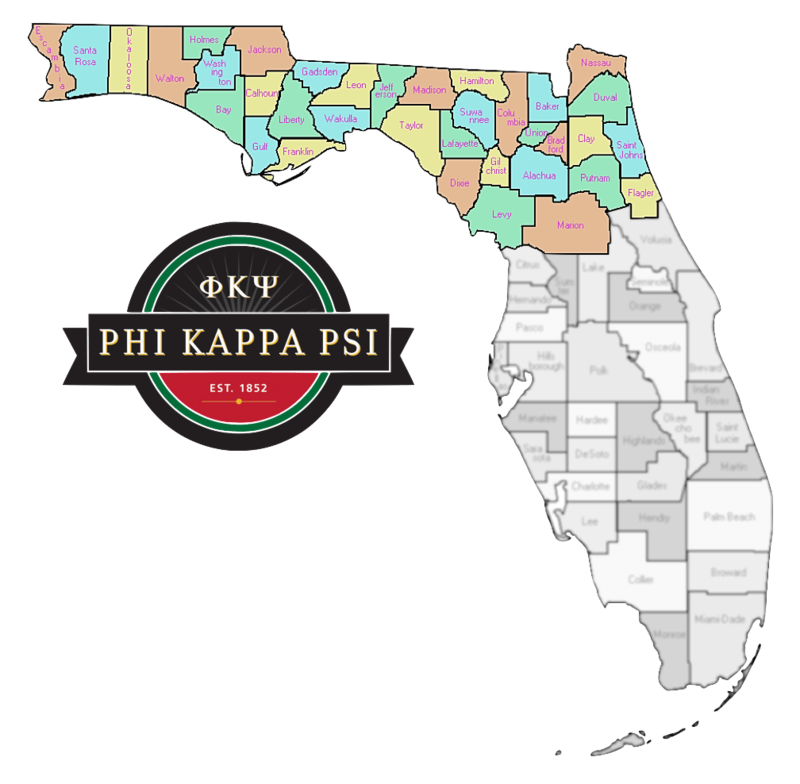 Florida’s excellent Interstate Highway System, with a posted speed limit of 70 MPH, means that no Phi Psi Alumni will be more than three hours, one way, from Tallahassee, the site of the only active chapter in the state, at this time, and where an annual Founder’s Day observance has long been celebrated. Our Phi Psi Alumni ‘Band of Brothers’ is looking forward to continuing the longtime tradition of holding an Annual Founder’s Day activity in Tallahassee, and now, with the establishment of the North Florida Alumni Association of the Phi Kappa Psi Fraternity, we would hope to not only draw more Phi Psi Alumni from North Florida, but also draw Phi Psi Alumni from the southernmost counties of Alabama and Georgia which share our State’s northern border.